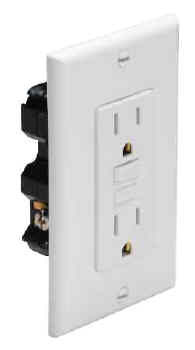 This white outlet includes Ground Fault Circuit Interrupter (GFCI) protection that is required when using electrical products outdoors or near water. GFCI protection is required by the ABYC where a receptacle is in a head, galley, machinery space or weather deck. The 1591-FI ivory outlet includes Ground Fault Circuit Interrupter (GFCI) protection that is required wen using electrical products outdoors or near water. GFCI protection is required by the ABYC where a receptacle is in a head, galley, machinery space or weather deck. CAUTION: Ground Fault Circuit Interrupter protection is required when using electrical products outdoors or near water. GFCI Protection is required by the ABYC where a receptacle is in a head, galley, machinery space or weather deck.